In a large bowl combine flour, sugar, baking powder, and salt. With pastry blender or two knives, cut in shortening until mixture resembles course crumbs, set aside. Place warm water in warm bowl. Sprinkle in yeast, stir until dissolved. Add yeast mixture and warm buttermilk to dry ingredients, blend well. Remove dough to floured surface. Knead dough 10 to 15 times, form into ball. Roll dough to 3/4 inch thickness. Cut into 2-1/2 inch biscuits. Cover and let rise until doubled in bulk, about 30 to 45 minutes. Bake at 400 degrees F (205 degrees C) for 15 minutes or until done. I don't know what I did wrong, but these came out hard as rocks and definetly not light and airy. I will probably try again but I had to resort to frozen biscuits for dinner. Foolproof and versatile! Try it for cinnamon rolls (use 1/2 shortening). Dress it up rolling it out in layers w/ butter like crescent rolls. So EASY and tasty. My husband loves these! I didn't have any buttermilk, so I substituted 1/2 yogurt to 1/2 milk. They taste like Hungry Jacks, according to DH. Thanks for sharing! My fiance loved these. They were tasty and easy to make. I also didn't get much rise during the proofing stage, but did while baking. These are great with fried chicken, with sausage gravy, & especially with strawberries & cream! They are very easy to make & the kids eat them up! Very good, but did not get much of a rise out of these even after waiting 1 hour. 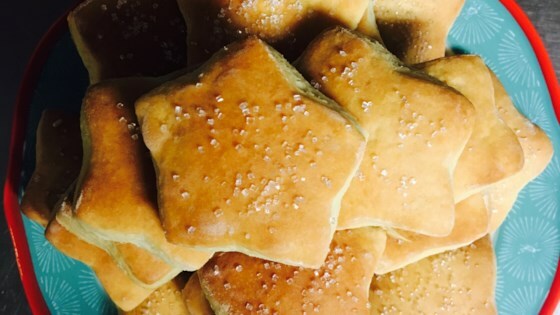 My Mom made angel biscuits all of the time when we were growing up. She passed away before I could get her recipe. This recipe brought back so many memories for me, just like my mom made.